Today, energy is an increasingly valuable asset and, as such, companies that handle large bottling and packaging systems are paying more and more attention to how using it, and choose high-efficiency and low power consumption machines. The line end solutions presented by SMI at Interpack in Düsseldorf keep in mind the needs for energy saving and environmental protection. SMI end-of-line packaging machines are equipped with brushless motors without using geared motors; brushless motors are high-efficiency motors, whose running speed is adjustable according to the real needs of each and every application, improving the overall performance of the production system. For many years now, Smiflexi shrinkwrappers no longer mount any geared motors. The same solution was recently applied also to the automatic palletizing systems of Smipal's APS series. The end-of-line system displayed at Interpack 2014 for secondary packaging, obtained by joining a Smiflexi packer with a Smipal palletizer, is driven solely by high-efficiency brushless motors (yield up to 98%), which ensure a marked reduction in power consumption, maintenance costs and noise levels. Furthermore, the conveyor belts used in the system are equipped with drives that regulate motor speed based on the machine's actual operational needs; as such, they provide the system with only the amount of energy required at a given time and ensure savings of up to 35% on power consumption. 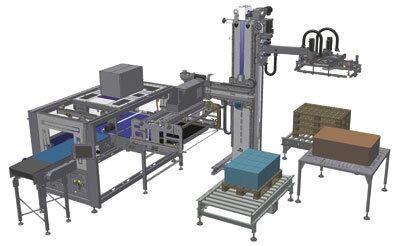 The compact end-of-line system on display at Smigroup's stand of Interpack uses the advanced technology of Smipal's new APS PLUS series, which integrates into the machine's fixed central column all the mechanical components in charge of palletizing layers, feeding empty pallets and inserting interlayers. The following three components move on the palletisation column: the layer-loading head-holding cross beam, which performs vertical movements; the loading head that, thanks to a telescopic guide-system, performs quick and accurate horizontal movements along the cross beam; an articulated arm based on SCARA technology that performs both vertical and horizontal movements for feeding the empty pallets and inserting the interlayers. The new palletizers of Smipal's APS PLUS series adopt a number of design features that, compared to traditional solutions, have led to a significant reduction in the size and overall dimensions of the system; furthermore, the integration of multiple functions (all housed in one central column) offers considerable advantages as far as operative flexibility, workplace safety and machine maintenance are concerned, with the option of concentrating the use of forklifts and transpallets in a well-defined zone, optimizing the management of loading and unloading areas. 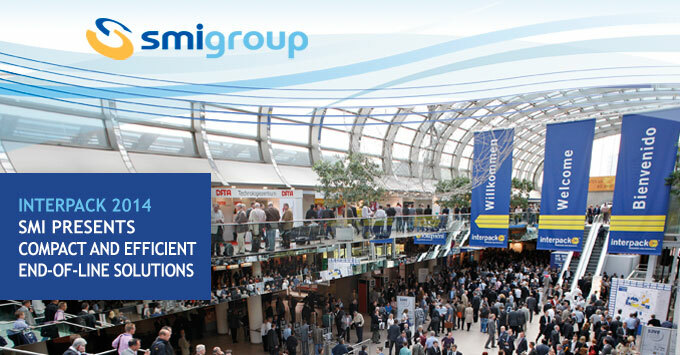 We look forward to meeting you at our stand 14D12 in Hall 14 and to giving you further information on newer bottling & packaging solutions by SMI.